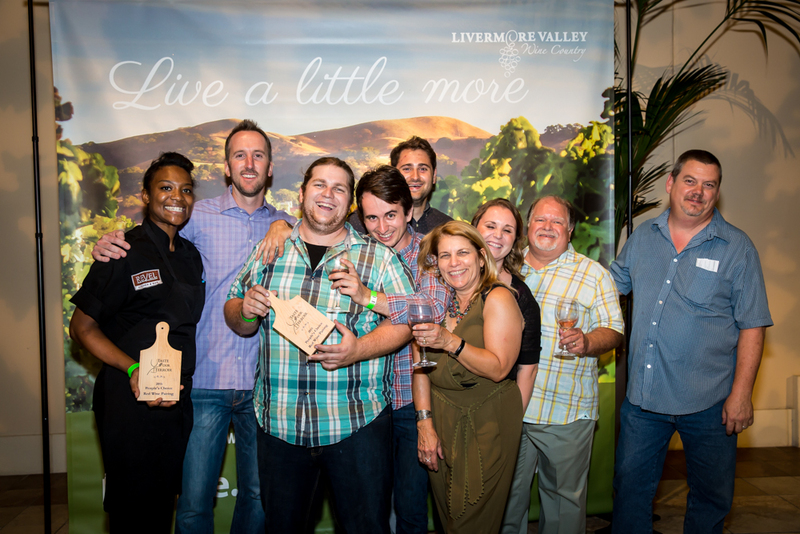 Taste Our Terroir, 2015 edition, paired Livermore wineries and their chosen restaurant partners to create what were some memorable marriages of food and wine. 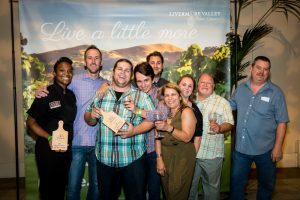 This year, 19 winery and restaurant teams went head to head to win over the palates and hearts of both professional judges and the consumers who came to enjoy this annual competition. 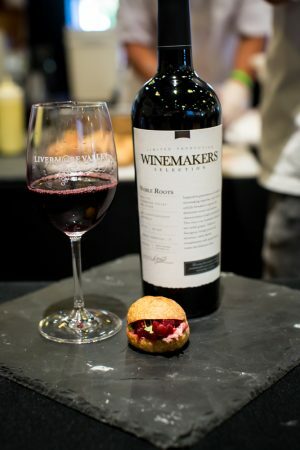 Each winery selects a wine to pair and the chefs get busy creating the perfect bite-sized dish to complement the wine. Cuda Ridge and Posada for 2013 Cuda Ridge Malbec paired with Eduardo Posada’s lamb cheeks simmered in Dijon mustard and sweet pepper sauce over pepita crusted mushroom brown rice patty with garnishes. McGrail Vineyards and Beets Catering for 2014 Kylie Ryan Rose of Cabernet and Merlot paired with bratwurst sausage fried in a stoneground cornmeal batter with fresh peach chutney, house-made mustard and honey. Winemakers Studio and the Grill at Wente Vineyards for 2010 Noble Roots blend paired with lightly smoked beef tongue on a sweet rye roll with a mustard of local plums and red beets. When I asked Larry Dino of Cuda Ridge earlier this year how he approaches the food and wine pairing process for this event, it was clear from his lengthy, detailed, refrigerator manual granularity that he takes this stuff seriously. And the results show. Last year, Cuda Ridge and Posada took “Most Innovative” from the Judges, just as they had done the prior year. 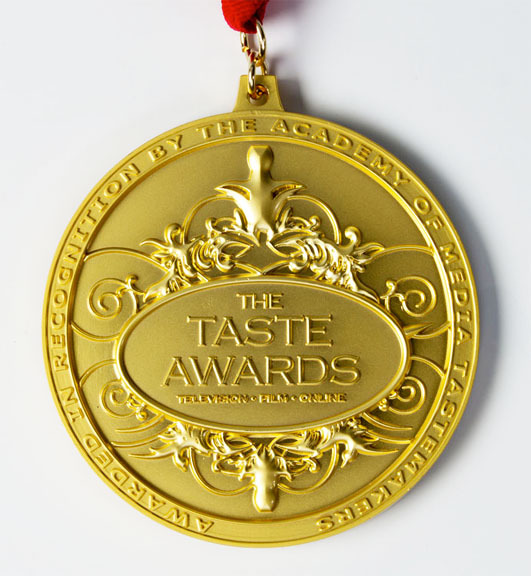 To achieve “Best Pairing” is an honor that they richly deserve. This dish was brilliantly complex, and impressively presented. As last year, the people got to vote twice: for their favorite white/rose pairing, and their favorite red wine pairing. This at least guaranteed that there would be more whites/roses than in the past. In total, there were four contestants in this category. Vasco Urbano and Revel Kitchen for the 2014 “Speck” Grenache rose paired daintily to perfection with shrimp ceviche, avocado, cucumber and yuzu on taro root chip. I could eat this every day. Wood Family and First Street Ale House for 2013 Big Wood Zinfandel matched with “Moroccan Beef Tagine,” braised beef in a warm savory broth with chick peas, tomatoes and onion. Congratulations to all the winners. That’s the second year in a row that Rhonda Wood has worked with First Street Ale to win People’s Choice for Best Red. 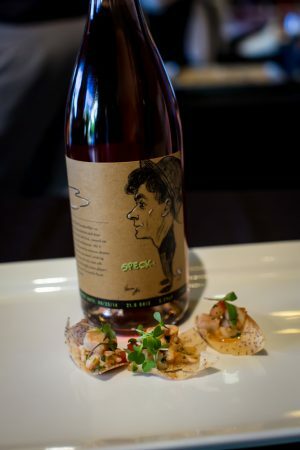 Sabio on Main, a new Spanish restaurant in Pleasanton, showed they know how create a spot-on pairing, making a wine shine even more brightly. The 2012 Las Positas Estate Tempranillo, an award-winning flashdance wherever she appears, made merry with the torchon of Canadian foie gras (finally, a righteous use for otherwise pestlike Canadian geese – ask anyone who owns or lives on a golf course), rolled with jamon serrano and Adriatic fig compote. If this had been served in a crusty little cone, it would have been the cat’s meow. 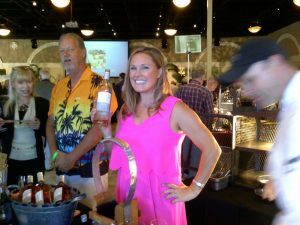 Debra Long of Longevity Wines is to be complimented for finding a lime green table scarf that precisely matched the lime green of the parsley pesto that topped the Bridges Golf Course lamb confit dish. The little bridge on the table was a nice touch, too. The Auburn James duck confit served on a crisp endive with blackberry reduction was not only easy to eat, it was delicious and refreshing, and the only vegetable in evidence. This pairing actually tamed the aggressively tannin-laden 2011 Diablo Rosso, a blend of Tannat and Merlot. Bravo! These little food delivery devices are great, when they can be made tiny and light. Filled with duck confit, gruyere, cherries, arugula and toasted almonds, these little bites created by the Restaurant at Wente Vineyards, was a great front porch swing companion with the 2013 Nth Degree Syrah. Double Barrel nailed their execution of “Surf & Turf,” which was divine on every level, combining Porcini-crusted and umami-glazed Ahi tuna and elk tartar with Asian slaw on a sweet potato bellini. Not only was this dish delicious, easy to eat and highly innovative, it was seamlessly textured. The velvety 2012 Steven Kent Winery Home Ranch Cabernet complemented the silkiness of the tartare to a “T.” This dish should become a staple at Double Barrel. 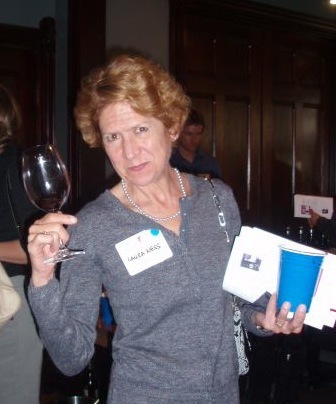 Salome Taylor of Retzlaff Winery should be acknowledged for being the only winery to pour a white wine. The 2013 Estate Sauvignon Blanc was quite harmonious with the house-cured salmon, Harley Farms goat cheese, cucumber, dill and pumpernickel crumbs by Teri Tith Concannon and Denise Garcia of Cheese Therapy. Most artistic and striking label goes to the 2012 John Evan Cellars “El Capitan” Petite Sirah. It’s a terrific wine, too. It looked deceptively simple: a Mario’s French Dip sandwich cut into two-bite-sized pieces, accompanied by a mini-cup of broth, but the flavors that were packed into this dish made it one I could enjoy over and over again. Mario’s incredibly tender pork tenderloin was slow roasted Creole style with chipotle and the dip was infused with the wine, a 2012 Crooked Vine Cabernet Sauvignon that took Double Gold at the 2015 Chronicle Competition. It was like two strangers showing up at the prom and realizing they were meant for each other. Sometimes the unexpected pleasures are the most enduring ones. Pebble Beach Food & Wine: Pasta, Barolo, & Whales Oh My!